The popular Cuban band Los Van Van, celebrates its 45 years with the release of a new album dedicated to its founder, Juan Formell (1942-2014), and a concert in Havana will close a national tour. Fantasy is the phonogram’s title, a theme composed by bassist Juan Formell, leader of the musical group died last May. It will be out next December 5, and from 2015 abroad, according to its promoters announced. 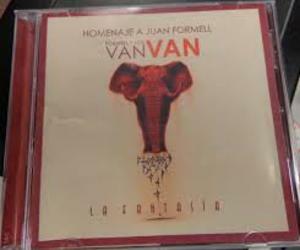 This is the first record of the current director of Los Van Van, Samuel Formell, who stressed that it is a tribute to his father (Juan Formell) and his musical legacy through 14 tracks, five of his own and the other signed by members of the orchestra. The album was recorded by the State Enterprise Recordings and Musical Editions (EGREM), but the mixing and mastering were done in US studies, with high-technology that was not available on the island, said the drummer and composer. Samuel Formell said that during the process of submitting a proposal disk Anglo Grammy and Latin Grammy in its next edition of 2015 arose. Since its founding in 1969, the orchestra has released 30 albums, one of which came Van Van, won the 1999 Grammy Award.